Less than 24 hours after the announcement of the latest Assassin’s Creed game, we have already been ‘treated’ to four different special editions of the game! Ubisoft’s official site lists the Standard Edition for £49.99, and the Gold Edition for £69.99, which includes the game’s season pass and an exclusive Baker Street outfit. Now, onto the more lavish options. Assassin’s Creed Syndicate’s The Rooks Edition offers a second extra mission – Runaway Train – plus an artbook, soundtrack, double-sided London map and exclusive collector’s box. 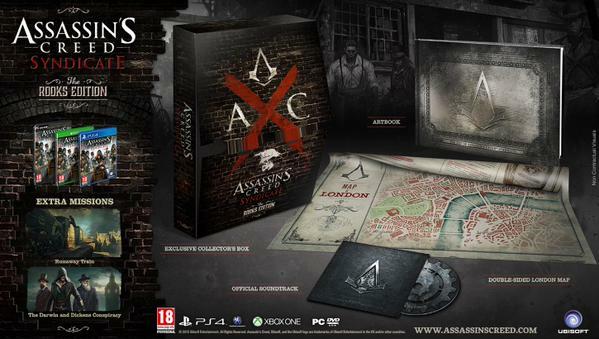 It costs £59.99, slightly cheaper than the Gold Edition, but it doesn’t include the game’s season pass. 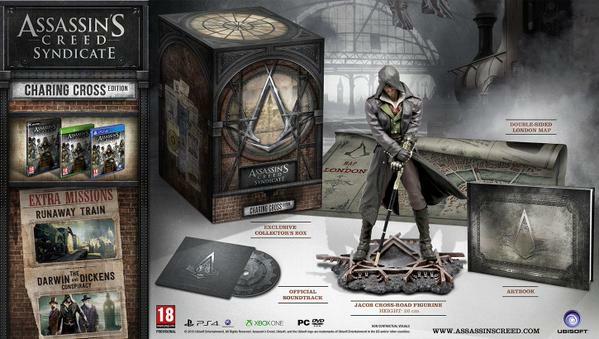 Next up is the Assassin’s Creed Syndicate Charing Cross Edition, which includes the Runaway Train mission, artbook, soundtrack and map, plus its own exclusive box and a 26cm figurine of Jacob. It costs £74.99 and doesn’t include the season pass, either. Finally, there’s the Assassin’s Creed Syndicate Big Ben Edition. 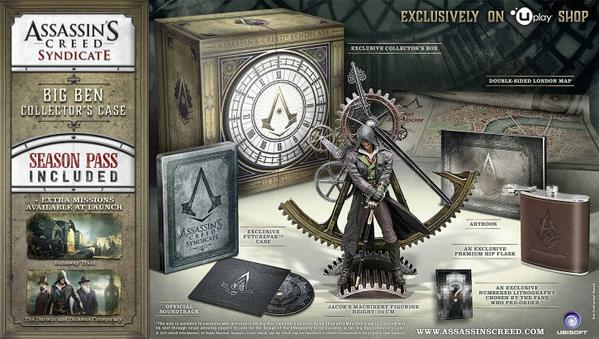 It includes the Runaway Train mission, artbook, soundtrack, map, another special box and an even more extravagant version of the Jacob figurine, standing against a set of clock machinery. Other exclusive items include a FuturePak case, “premium” hip flask with Assassin’s Creed branding and an exclusive numbered lithograph. The Big Ben Edition costs a bell-ringing £114.99, but does include the season pass. Quite frankly I find it a little disgusting that we’re already seeing season passes and DLC missions already being talked about. Does a game really need four different special editions? Let’s not forget that we will probably see a couple more versions for different retailers pop up too. What do you think of these editions, are you tempted by any of them? What bothers me is that 2 of the 4 special editions come with the season pass, including the £70 Gold edition (which is £5 less than the Charing Cross Edition). As long as the season pass isn’t going to cost the price of the standard edition as well, should be interesting.